Sunday 6th August 2017 AFL International Cup Mens divison 1. The wind may have dropped off but the heat was on field before the maiden bounce. Both sides seemed intent on a little intimidation. With France being promoted to first division it was felt Fiji were going to be favourites. Fiji were immediately into attack and it didn’t take long befpre a chipped pass to the square cleared the French fullback allowing a goal to be rushed. Though the Fiji Tribe controlled most of the action it was the French who made the most of their limited opportunities. They forced errors from the Tribe and used the ball wisely. Whilst Fiji were more athletic with spectacular jumping they tended to blaze away rather than mount a measured attack. Later in the quarter Alipate Navuso #12 gathered the ball and snapped truly for only the second goal of the quarter for the Tribe. From limited opportunity the Coqs had scored 2 points for the Quarter whilst keeping the Tribe to a very modest 2 goals 4 behinds. The encouraging start for the Coqs continued in the second term with Anthony Girard #25 marking and passing to centre which resulted in a goal for the French. This score and stout defence like that of Marco Pinto’s #23 tackling rattled the Tribe. Though they mounted continual attacks many kicks were ineffective until Isimeli Qiolevu #29 marked dominantly and the resultant free-flowing passage of play led to a fine goal. This put more system into Fiji’s play and Alipate Kiti chipped a goal from broken play. Mesake Koroi #26 marked and the kick found its way to Isimeli Qiolevu #29 who snapped for goal. He followed up with some good barge and tackle tactics. One player that tried to prevent the breakaway by Fiji was Julien Dagois #29 for the Coqs. Half time had seen the Fiji Tribe assert themselves on the scoreboard 5.7 (37) to the France Coqs 1.2 (8). The third quarter saw the Fiji Tribe continue to press home the advantage. Early in the quarter saw Alipate Navuso #12 execute a superb rugby style horizontal handpass to a running Jeffery Pauli #4 to slot home a goal from close in. 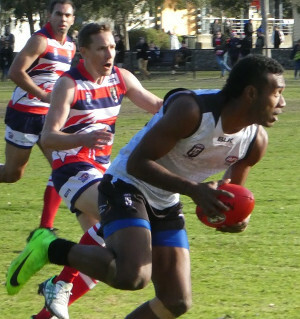 Fiji locked the ball into their forward line and defenders like Sylvain Maylie #89 were continually called upon to defend. Then against the flow a series of well constructed passes saw a running goal slotted from near the arc by the French. The charge couldn’t be maintained however and Nimilote Tuiloma Qio marked well and his kick was marked by Alipate Kiti #4 in the square for another goal to the Tribe. By now the game had opened up and the Coqs were benefitting as well as the Tribe. A kicking-in-danger decision in the square gave Jeffery Pauli #4 an easy conversion for the Tribe. 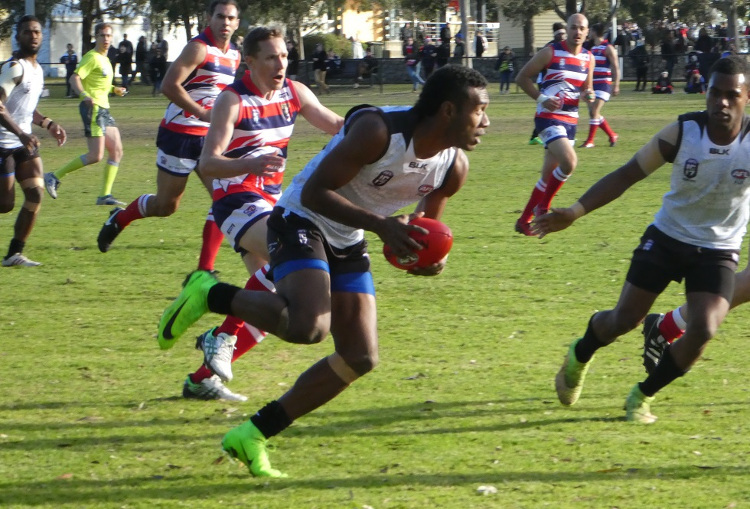 Fiji started the fourth quarter with a commanding lead 8.14 (62) to the Coqs 2.3 (15). Despite the wind freshening victory was seen as beyond France’s reach. They did not add to their score but still did well to restict Fiji’s scoring. After some missed attempts by others, Mesake Koroi #26 marked well and goaled. Not long after, Jonathan Macanawai #18 marked the kick-in and his kick allowed Yabaki Gade Cakautini #3 to scramble a goal. Final score Fiji Tribe 10.20 (80) to France Coqs 2.3 (15). The Fiji Tribe is a very athletic team that blends physicality with flair and they will gain competiveness with experience. The France Coqs have improved greatly since 2014. Editor: The Tribe look like they will be a dangerous opponent in Division 1 - perhaps not good enough to defeat the top few teams if those teams play well, but beware anyone who thinks they can take the Fijians easily. It will be interesting to see how close Fiji can stay with New Zealand in the next round. This result makes it seem like there were really 9 Div 1 sides and 9 Div 2 sides, but we really didn't want to have two teams getting a bye round and the question was, "Do we put a too weak side in Div 1 or a too strong side in Div 2?" I think this was the right call. I've tipped NZ to go all the way, and Round 1 hasn't changed that, so they will be a huge test for Fiji. I would need to ask, but the French may have requested Div 1. Potentially, the draw may have been more even with France and Japan swapped between divisions, but not sure what Japan's input was either. No matter who you could have switched France for in Division 2, all of Japan, Germany or Croatia (and now China has proven Croatia aren't as strong as expected) they all would have struggled in Div 1. In reality I think we do have a 9 and 9 split here and to avoid byes we have to have someone in the wrong division, and I think that is France. To have forced Fiji along with France into Div 2 would have been a terrible decision. Yes, technically should be 9/9 split. But this current situation is the best choice. for practicality. I Take it that France are happy in div1 as against being potential div2 winners.. France stuck well with Fiji but ultimately fell away. It will be hard for them to keep up the pressure throughout the comp but they have done similar in the past. I agree with Rog that moving Fiji to Div 2 would have been a terrible choice... They would have belted the newer sides. AFAIK Tonga were close to making it - and they would have been Div 1. So the organiser may then have moved France (and the bye) to Div 2. At any rate, at least we didn't have any first-round blowouts to the extent of last time, at least not in the men's comp.